Experts estimate 100 million Americans are now age 50 or older. What's more, demographics show that even after retirement, people still have another 20% to 25% of their lives ahead of them. Do you want to spend nearly a quarter of your life feeling less than the best? Resveratrol is a phenomenal age-defying discovery. As 60 Minutes reported in January 1991, scientists across the country have identified a substance in red wine called resveratrol that they believe might do more than just protect the heart, but could in very high concentrations significantly extend life by preventing a number of age related illnesses. Many health experts hail resveratrol as the miracle molecule behind the "French Paradox"... and for good reason. The French drink more wine than most any people, eat loads of rich foods and smoke like chimneys—yet live 30% longer and have significantly better heart health than Americans. Reports suggest red wine seems to have twice the average resveratrol concentration of the equivalent commercial juices. Please watch our video so you can have a better understanding of why our Resveratrol can work for you and why people are amazed at the results they get from using it. A Korean study showed that trans-resveratrol supplementation increased testosterone levels in mice which have led to its marketing as a bodybuilding supplement. A Spanish study has also shown the antioxidant to increase sperm production in rats. By now, many people have heard that oxidized low-density lipoprotein (LDL) is a problem in heart disease. This is why certain supplements may help prevent heart problems—they scavenge the radicals that oxidize this fat/protein. However, the kind of radicals that these supplements block are not the only kind of free radicals people have to worry about. There are other types, which is why it’s important to take all of the known antioxidant vitamins. Many antioxidants are good at scavenging artery-damaging radicals, but resveratrol emerged as one of the best defenses against certain types of radicals. This points out the importance of using a multi-approach to antioxidants. One of the serious complications of free radical damage is hardening and thickening of arteries. A “vicious cycle” of radicals, artery damage, and narrowing due to scar tissue that, in turn, promotes more free radical activity and more damage, has been described. Resveratrol, melatonin and Probucol are suggested as treatments for this progressive process. 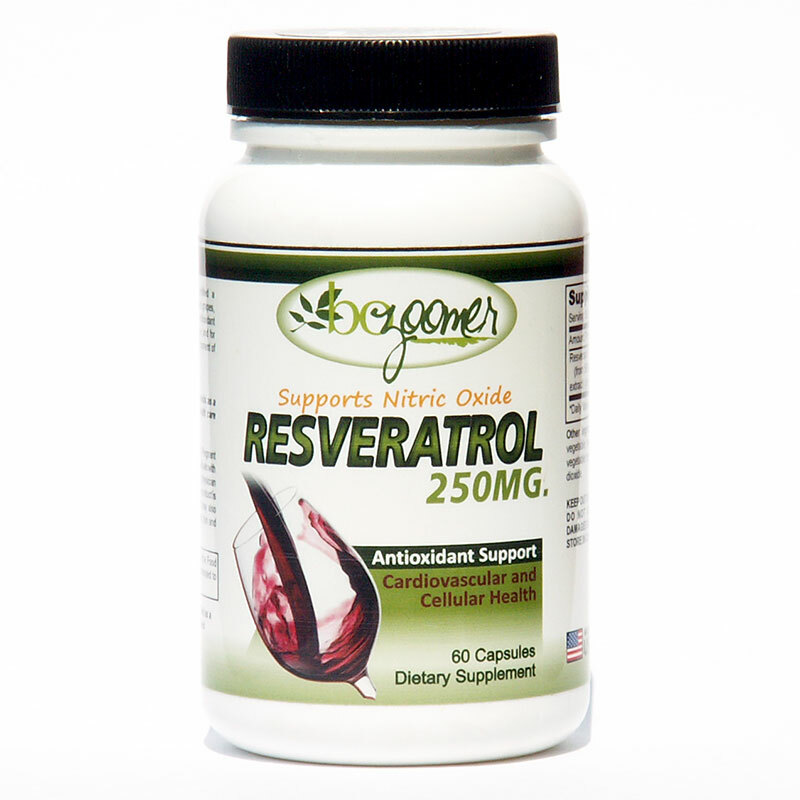 Resveratrol’s antioxidant action helps stop free radical damage and opens the arteries by enhancing nitric oxide. Nitric oxide is a critical component of heart/artery function. It allows blood vessels to “relax,” which enhances blood flow. In a recent study, a high-cholesterol diet decreased nitric oxide by about a third. Resveratrol supplements significantly reversed the trend. 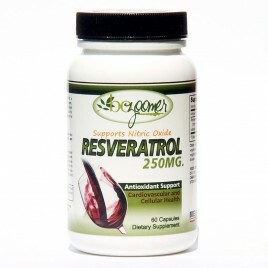 In this respect, resveratrol is similar to Viagra, which also affects nitric oxide. However, whereas Viagra only affects small vessels, resveratrol affects the main arteries. Finally, resveratrol also stops the proliferation of cells in blood vessels that narrow the arteries, and it also keeps blood cells from sticking together. Both are very important for preventing heart attacks. It was shown recently that resveratrol possesses a “novel mechanism” for scavenging radicals. Might this novel mechanism protect the brain from free radical-driven diseases like Alzheimer's? Alzheimer's patients produce an abnormal peptide (a piece of a protein) known as “beta-amyloid” in their brains. Beta-amyloid provokes oxidative stress, and eventually cells are killed because of the abnormally high levels of free radicals. The killing of brain cells causes the gradual decline in Alzheimer's patients. 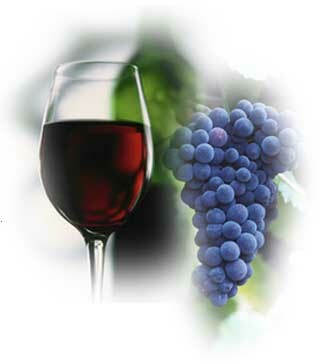 It has been proven that resveratrol may protect the brain against oxidative stress, and may help keep cells alive. Research shows that adding antioxidant vitamins C and/or E to resveratrol provides a greater degree of brain protection than any of these antioxidants alone. A recent study by Chinese researchers is notable. If confirmed by other researchers, it could be very important for people who undergo serious brain/spinal trauma or stroke. In these types of injuries, the body’s response causes further injury, and for that reason, people are treated with drugs like cortisone, and in the case of stroke—aspirin. The idea is to reduce the body’s inflammatory response to the injury. The study from China showed that resveratrol may reverse the signs of inflammatory response to spinal cord injury on a level comparable to prednisone (a steroid used to reduce inflammation), but with better energy compensation and protection against free radicals, when injected immediately after injury. Besides helping to ameliorate this type of injury through free radical blockade, resveratrol actually inhibits specific enzymes that change the way individual cells respond to the injury. It’s possible that if a person regularly takes resveratrol supplements, they will be more likely to withstand a stroke or other injury to the brain. Less motor damage and less brain damage occurred post-stroke. Knowing the most dynamic area of resveratrol research. Resveratrol is the first natural medicinal to have solid evidence behind it showing that it help with many stages of health problems. Resveratrol not only may help, it’s being proposed as an additional treatment. Resveratrol is a broad-spectrum agent that may help with health treatments in many diverse ways, from blocking estrogen and androgens to modulating genes. Some of the latest information about it shows that resveratrol causes a unique type of cell death, and kills bad cells whether they do or do not have the tumor suppressor gene. It also works whether bad cells are estrogen receptor-positive or negative. In addition to these findings, researchers are beginning to uncover the ability of resveratrol supplements to augment other chemotherapies. For example, vitamin D-3 converts to a steroid that may inhibit the growth of breast cancer cells. Researchers at the University of Notre Dame have shown that resveratrol also increases the effects of vitamin D-3. Researchers in Austria have done elaborate studies showing that resveratrol blocks the ability of bad cells to metastasize to bone (30-71%). The highest results were for pancreas, breast, and renal. Prostate and colon were also inhibited, but not as much. Resveratrol also acts against a component of the Western diet that promotes bad cell growth: linoleic acid. Linoleic acid is converted to arachidonic, which is converted to hormone-like substances that can promote inflammatory processes that stimulate bad cell growth, among other things.